September 22, 2015 By Tina M 3 Comments This post may contain affiliate links. Read my disclosure policy here. 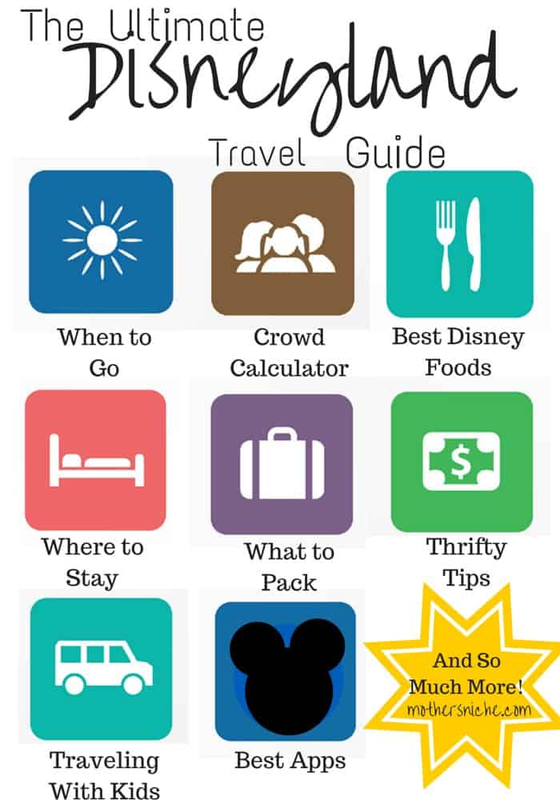 Are you planning a vacation to Disneyland? 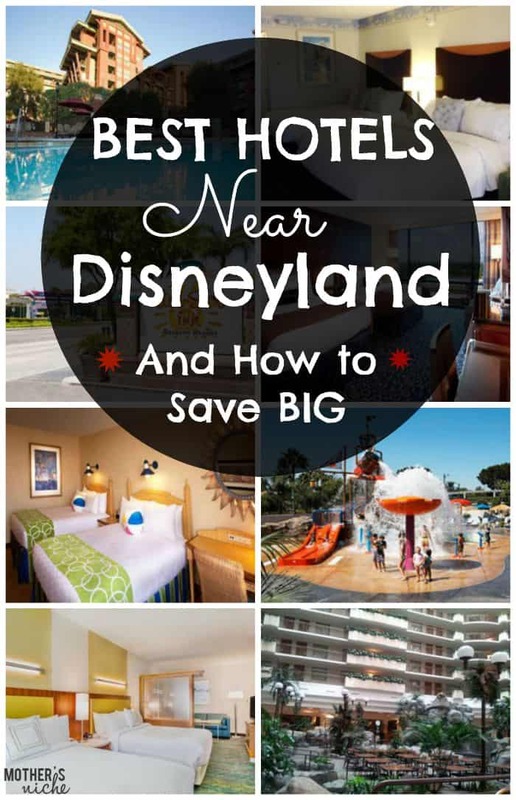 If you are overwhelmed by the amount of hotel options, or whether or not you should spend money on a Disneyland hotel, here is a comparison of the top 11 hotels near Disneyland! Hey, it’s Tina’s friend Kimberly with Get Away Today and I am so excited to be here on Mother’s Niche to share my top hotel pics for the Disneyland Resort area. As a staff, we visit the Disneyland Resort area at least once a year. During this time we stay at different hotels and tour all of the hotels that we work with. In addition to that, I am a little bit of a Disney nut, so I go on my own as often as possible as well. Over the years, I have stayed at many of the area hotels and I definitely have opinions on them. It’s always a tie between Disney’s Grand Californian Hotel and the Disneyland Hotel. The Grand is my first choice based primarily on location. 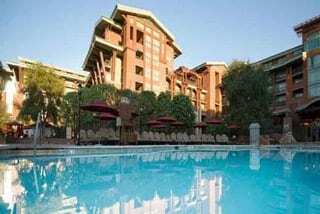 It’s the only hotel that is located inside a theme park and it is the most deluxe of the three Disney hotels. The rooms are really comfortable and you feel like you are in the middle of the magic – because you are. If you don’t have a park view, you’ll have a view of the pool, or the greenery. You really feel like you are in forest. It is awesome. Plus, it’s the only hotel that has a private entrance directly into Disney California Adventure Park. However, out of the three hotels, it is the priciest. As I mentioned earlier, my tie for first place is the Disneyland Hotel. The Disneyland Hotel has my favorite theme of all three hotels. There are giant teacups in the lobby, a monorail water slide swimming pool, and Sleeping Beauty’s Castle with “real” fireworks adorns the headboards in the guest rooms. It’s home to Trader Sam’s, my favorite restaurant experience at the entire resort. There are tiki torches, fire pits and live music on the hotel grounds each night, and it is so magical! It is splitting hairs when it comes to picking a favorite of the Disney hotels, but I have to say the only reason the Disneyland Hotel is a tie for first place instead of first place is because it is a little farther from the main gates than the other two hotels. However, it is a quick walk to the Monorail which will take you right into Tomorrowland and it’s the closest hotel to Earl of Sandwich, my favorite restaurant in Downtown Disney. Even though it’s my third-place choice of the Disney hotels, I would still stay at Disney’s Paradise Pier Hotel in a heartbeat. In my opinion it has a better location than the Disneyland Hotel. It is located right across the street from Disney’s Grand, so you can just hop on over and use their private entrance. 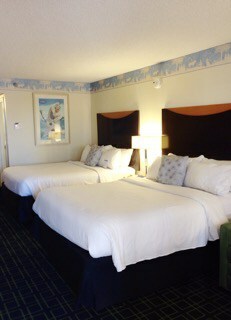 Plus, the rooms at the Pier are the largest guest rooms of the three hotels. Almost every room has two queen beds and a single sized pull out sofa bed. 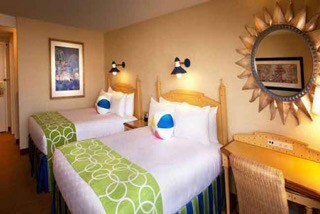 The rooms also have a super cute beach theme with the cutest beach ball pillows. Another plus for this hotel is out of the three it is the most affordable. The biggest reason why I always choose to stay at a Disney hotel when I can is because of the early morning entry that’s offered every day only to hotel guests. Unlike the Magic Morning that comes with 3-day and longer tickets, it’s good for every day of your stay and it’s the only way to get into California Adventure (including Cars Land) early. Not to mention, if you buy anything at the parks, you can have it sent straight to your hotel and don’t have to carry it around all day. Your room key also acts as a charge card, so you don’t have to worry about losing your credit card or cash. Fairfield Inn: While most hotel rooms will allow five guests in a room, it’s not always comfortably. Most rooms at the Fairfield Inn come with two queen beds and an individually sized pullout sofa bed, so it’s perfect for families with three kids. Their rooms come with a fridge, plus they have an on-site Pizza Hut and are within walking distance to other affordable restaurants. The Fairfield also has a small number of Disney themed rooms, which are really fun if you want a Disney experience but can’t stay on property. You can pick from Frozen, Pirates, Cars, Toy Story, Disney Princess, Finding Nemo, and of course, Mickey. These rooms go quickly, so you’ll want to book them well in advance. Camelot Inn: This is one of my favorite hotels because it is as close to the main gates as the Disneyland Hotel. The rooms are really comfortable, but my favorite thing about this hotel is the pool. It’s not very big, but it’s on the fourth floor and has a fantastic view of the Disneyland fireworks. 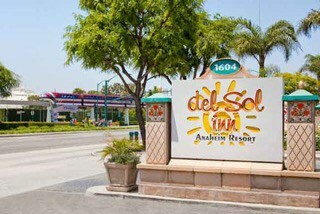 Del Sol: This hotel is so small and tucked away that if you blink, you might miss it. All of the guest rooms have a microwave and fridge, and they have some really fun kid rooms with bunk beds. It’s one of the only hotels in that strip right across from the main entrance that offers a free breakfast. Because it is so small, the rooms go quickly. If you want to stay here, you’ll want to book early. 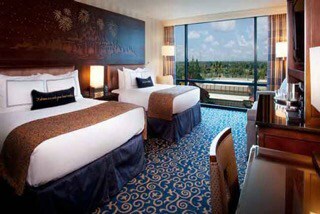 Howard Johnson: This is another great choice if you want to be within walking distance to Disneyland. It has a retro 60s vibe, and the rooms are quite standard. However, they have one of the best pools in the area. They have a fun splash area that is pirate themed for little kids. If your kids like to swim, it is sure to be a highlight of your trip. 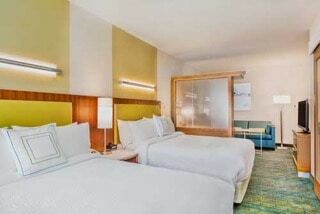 Homewood Suites: The Homewood Suites is a great choice for families. Every room comes equipped with a full kitchen, and the hotel will even do grocery shopping for you! You just pay for the groceries. They serve a full hot breakfast every morning, and a light dinner on Monday through Thursdays. It is awesome! 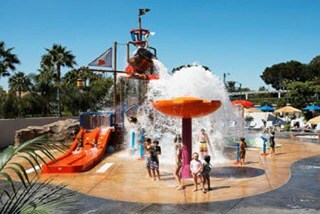 Springhill Suites: There are two brand-new Springhill Suites that are both within about a mile of Disneyland. They have huge studio suite rooms that sleep up to six. I love the fresh, clean rooms. And, they have a generous breakfast buffet every morning. 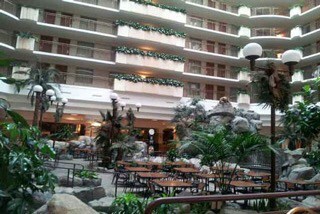 Embassy Suites Anaheim South: I love this hotel for a lot of reasons. One is the full free breakfast every morning with the cook-to-order omelet station, and the other is the rooms. There is a separate living room area, and the living room and the bedroom each have nice flat screen TVs. It’s perfect for traveling with the family. One thing that is really fun about this hotel is the atrium. There is a real waterfall with koi pond. There’s also an animated lion that roars every hour on the hour. Kids love it! The Staybridge Suites is another one of my favorites because it is one of the only hotels that has a two bedroom suite that will sleep up to eight people. No matter what size of suite you choose, every room comes with a full kitchen. They also serve a free hot breakfast every morning and have a managers reception Tuesday through Thursday where they serve a light dinner. They share a huge pool area with the Holiday Inn next door. The pool is shaped like a free form Mickey head and is surrounded by barbecue areas that guests can use. There are so many fantastic hotels, it was really hard to narrow it down! And, of course all of the agents at Get Away Today have their favorites as well. You can view the entire offerings of Get Away Today hotels at getawaytoday.com, or you can call and talk to an agent yourself. Since we’ve all been there, we all know. Just be sure to let your agent know that Mother’s Niche sent you because we give all her readers an extra $10 off their vacation package using code MOTHERSNICHE! We are so excited to help you plan your next Disneyland vacation. My entire family and I just got back from our most amazing Disneyland visit yet! The Diamond Celebration was epic! After reading your article, half of us decided to stay at the Fairfield and the other half stayed at Paradise Pier. My family’s room at Paradise was super adorable and the views of California Adventure were amazing. But I can tell you that Fairfield did not disappoint. It actually exceeded our expectations. The rooms were very nice, very large, clean and comfy. We had 3 rooms amongst us and each had its own Disney theme. The staff was awesome and very accommodating. I will not hesitate to stay there again. We were all so happy with our hotel choices and met at the gates everyday with no problem as both hotels were within walking distance. I believe Fairfield may have been a little closer. Hope this feedback helps! Side note: We stayed at the Embassy Suites several years ago, and although not within walking distance, we still had an amazing experience. Shuttle service was awesome but you do have to keep in mind the schedule and wait times.